Summer calls for swanning around in next-to-nothings, sultry sounds and sipping on colourful cocktails. It also calls for skewered food. Can you hear it? Skeeeeeeeeeeeeee-weeeeeeeeeeeeeeers. Okay maybe that's just me. These skewers will have you calling out for more though. Even if you aren't swanning around in next-to-nothings. And let me just say, apricots are a very under appreciated fruit. Especially when it comes to skewers. They add a delightful tang to the other ingredients. Try them skewered and wrapped in bacon - it is truly divine. 1. Cut chicken into bite-sized cubes, then marinate in a mixture of the lemon juice, oregano, garlic, salt and yoghurt. Leave to soak up the flavours for an hour. 2. Thread the chicken, mushrooms and apricots onto skewers and place on a baking tray. 3. Bake at 180C for 20 - 25 minutes until chicken is cooked but still tender. I just love your pictures - they're always so colourful. Thanks Robyn - I'm absolutely in love with colour! Skewering food definitely makes it taste better. Or it makes it fun to eat, which then makes it taste better. Or a combination of both. These seem like they have so much flavor! Love it. Lovely post, I can taste it already only with reading the recipe, great marinade, another dish to do when I am back at home. Skewers are fun, aren't they? 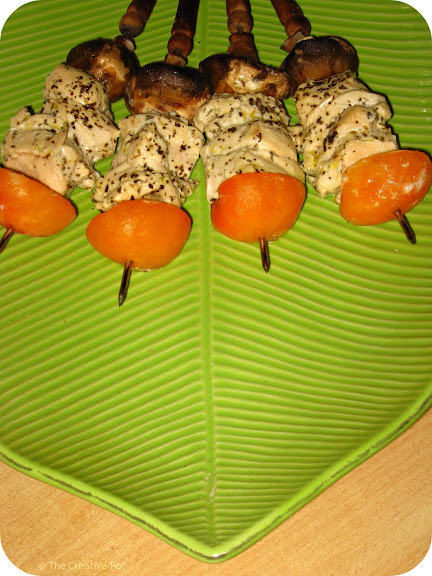 I love doing skewers and the combination of chicken with yoghurt is sooo good! Love the serving plate!